A 140,000-square-foot five-storey building is rising right beside the busy central corridor through St. Albert, a well-to-do suburban community north of Edmonton. Nestled among the big-box Costcos and other retail chains on St. Albert Trail, in close proximity to high income residential neighbourhoods, U Store It Canada Ltd.’s highly visible building represents the new image of the self-storage industry. The bottom floor of the building has 9,000 square feet of retail space available for lease. All of U Store It’s storage units are indoors in the four floors above. The building will sport a sharp copper, zinc and dark red exterior. But beyond the upmarket image is the most important thing: location. Visibility and convenience are crucial in the increasingly competitive industry, say company owners Edith and John Marshall and the firm’s vice-president Dean Ursulak. John Marshall (who is Edith’s son) says the new building, with its prime location, retail on the main floor and state-of-the-art security features, is the model for the company’s present and future plans. The 40-year-old firm, which was one of the first self-storage companies in the west, has three facilities in Edmonton and one in Red Deer, Alta. The St. Albert location will open in early 2019. The company has a parcel of land in Calgary where it plans to build a project similar to the St. Albert facility and U Store It is looking for opportunities elsewhere in Western Canada. A key determining factor for any project will be location, as it was when the Marshall family built its first U Store It in West Edmonton. Edith Marshall has seen huge changes in the self-storage industry. When she and Robert started building their first location in 1977, no one really knew what self-storage was, she says. The couple had seen the concept in the United States but the idea of self-storage was new to customers and to bankers in Western Canada. It took a mortgage on the family home, cashed-in Canada Savings Bonds and investment from family in the first years, says Edith. Municipalities also didn’t quite get the concept. The red tape was a special challenge for getting approval for the first building. “It took more than two years. They threw it back and forth. It was a nightmare,” says Edith. Now the need for the amenity is recognized and the self-storage market is booming. “It’s one of the hottest markets right now. Everyone wants to get in,” says Ursulak. Hard facts and figures on the self-storage market, particularly for Canada, are scarce, he says. Residential customers may be storing recreational vehicles and other discretionary or seldom-used items. Downsizing seniors are customers particularly in the city’s West End, says Edith. There are also commercial customers, which John says are popular because they tend to be stable clients who need large space and for longer periods of time. At the company’s Red Deer location, customers can also lease office space, a simple way to do business, especially for start-ups. U Store It is counting on St. Albert’s Erin Ridge neighbourhood being a growth area in the fast expanding north St. Albert area. Ursulak says new homes often aren’t built with a large amount of storage space. People are asking, “Where do I store my giant nutcracker from Costco?” says Ursulak. While customers recognize the need for self-storage, there are still business challenges to overcome. Old-school real estate firms will suggest light industrial land when they hear firms are looking to develop self-storage projects, says Ursulak. 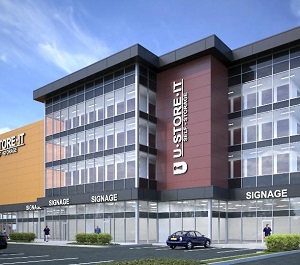 U Store It partnered with developer Landrex to build the new building. Landrex is also the lead developer in the Erin Ridge area. Landrex president Jim Sheasgreen says Erin Ridge will have about 350 acres in residential development. His firm agrees homeowners want nearby amenities. “We have higher density in this neighbourhood than the city’s ever seen and rather than drive 15 or 20 minutes to store items, we thought it was a pretty good use to mix that into commercial and residential,” says Sheasgreen. He agrees the storage business has evolved from the single-storey warehouse style to the state-of-the-art, temperature-controlled facilities U Store It is building. “Storage should not just be seen as something you throw in a back corridor, in an industrial area and just forget about it,” says Sheasgreen. Land is a big expense due to the amount of square footage needed for these facilities. “The only way it’s (economically) viable – you’ve got to go up, not out,” says John. But the facility isn’t the type of business where there are many employees, or even customers, in the building at one time. That’s still an issue when dealing with zoning and regulations. “Parking requirements are insane. They look at it and say you need 180 parking stalls,” based on the square footage, says Ursulak. He says some municipalities still need to realize self-storage facilities are not the same as conventional retail/commercial buildings.